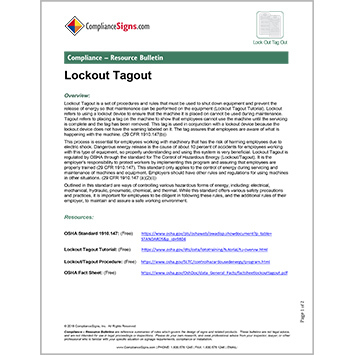 Lockout Tagout is a set of procedures and rules that must be used to shut down equipment and prevent the release of energy so that maintenance can be performed on the equipment (Lockout Tagout Tutorial). Lockout refers to using a lockout device to ensure that the machine it is placed on cannot be used during maintenance. Tagout refers to placing a tag on the machine to show that employees cannot use the machine until the servicing is complete and the tag has been removed. This tag is used in conjunction with a lockout device because the lockout device does not have the warning labeled on it. The tag assures that employees are aware of what is happening with the machine.